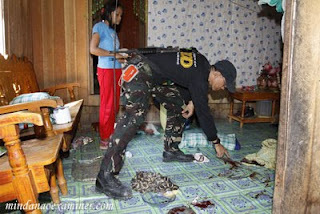 Police forensic and bomb experts search for debris at a house after a grenade attack left 6 people wounded Monday, November 2, 2009 in Cotabato City in Mindanao. 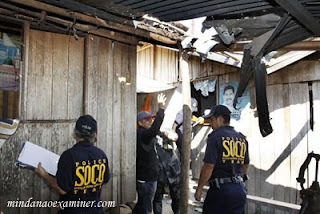 (Mindanao Examiner Photo / Mark Navales). 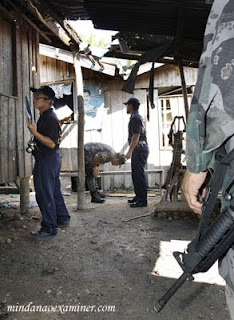 COTABATO CITY, Philippines (Mindanao Examiner / November 2, 2009) – Seven people were wounded in a grenade attack Monday in Cotabato City in the southern Philippines, police and military said. Police said five of the wounded were all minors and that the motive of the attack is still unknown. 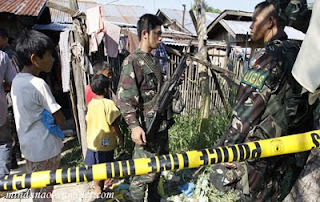 It said unidentified men on a motorcycle lobbed the grenade at house in the village called Rosary Heights and exploded on the roof. 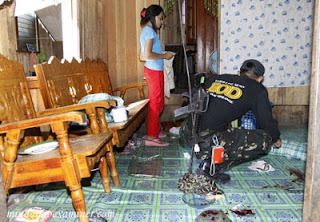 The wounded were identified as Bai Lani Sampulna, 4; Bai Ungge Sampulna, 6; Bai Pina Sampulan, 7; Norhaya Aziz, 10; Papaikan Mabang, 6; Pelma Aziz, 40; and Babo Angki Mabang, 70.